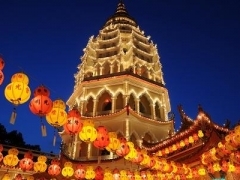 Enjoy a refreshing and gastronomic 3D2N stay at PENANG for only $235 per pax! FLAMINGO HOTEL BY THE BEACH has a beautifully serene environment and is strategically located in Tanjung Bungah, only a short driving distance away from Penang town and other popular tourist attractions! Eating is almost considered a favourite pastime here with many coffee shops and eateries open until the wee hours of the morning. Some (notably the Nasi Kandar outlets) are open 24-hours daily, serving rice, piping hot curries, noodles and an array of mouth-watering fare to hungry patrons round-the-clock! Flamingo by the Beach is a 4-star hotel strategically located in Tanjung Bungah - alongside the luxurious beach of Penang's northern coastline. We are a short drive away (15 minutes or less) to the fantastic hawker food paradise of Gurney Drive, Gurney Plaza, Botanical Garden, Island Plaza, Penang Heritage Trail, Komtar, Time Square & Prangin Mall, just to name a few. As to the famous Batu Ferringhi Walk (night market) it's only a 10-minute drive away.